I started off the first leg of the journey with a five hour van ride with my dad (always the worst part of any holiday when you live in Cornwall at the end of the country - no offence dad ;-) Taxi to Gatwick then a short flight to Nantes! 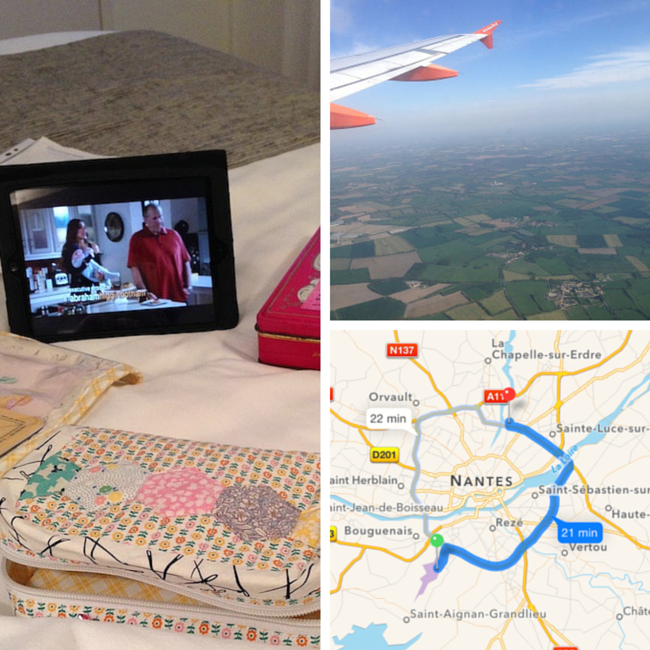 Yep it was my first experience of flying solo and my first time in France, ever! I was slightly nervous as you can imagine. My hotel was just a stone's throw from the exhibition centre and the main tram line which took you into the centre of Nantes in about 15mins so it was the ideal location. 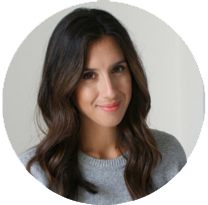 So what is Pour l'Amour du Fil? 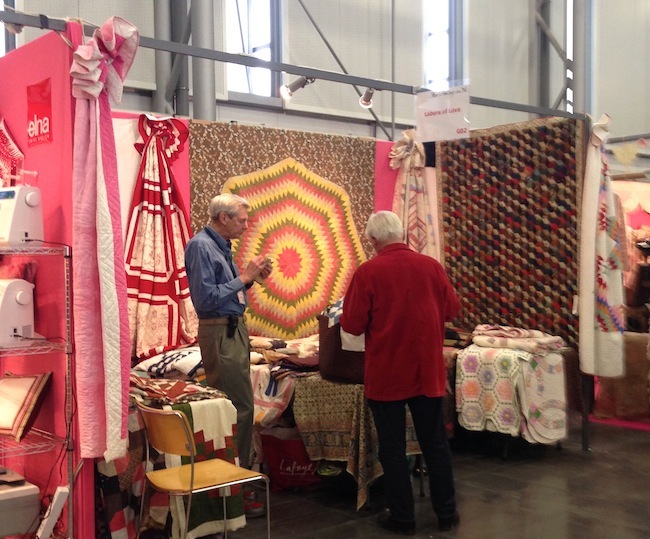 Well, it's an annual show held by Quiltmania celebrating thread and fiber arts. 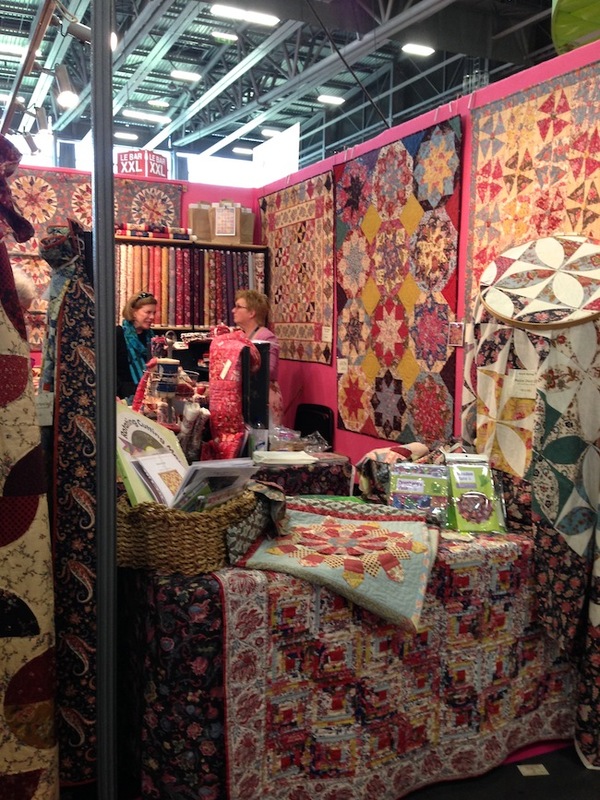 In it's 7th year, and gaining more popularity with a wider audience each year - and with Quiltmania being the organisers you can expect to see a unique and diverse range of leading international quilters like no other quilt show, and this year was no exception. 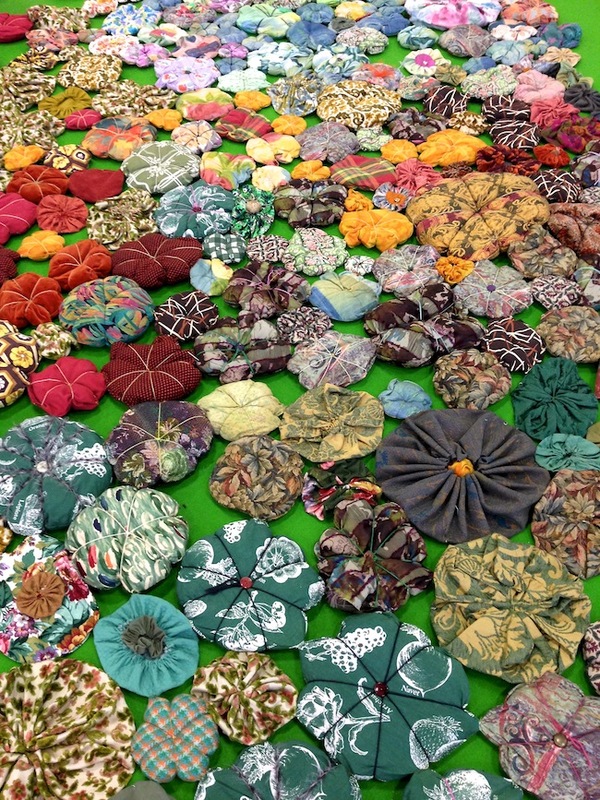 The headliners of the 2015 included Bill Volckening, Tomie Nagano, Fumiko Nakayama, Dijanne Cevaal, Kaye England, Kimberly Rado, Cecile Franconie, Irene Blanck and Willyne Hammerstein. Each artist exhibiting has their own specially decorated 'house' in which they have their beautiful work on display, and are on hand to talk to visitors. Many of the designer's have a new book release with Quiltmania so it's an opportunity to view the quilts from the book. 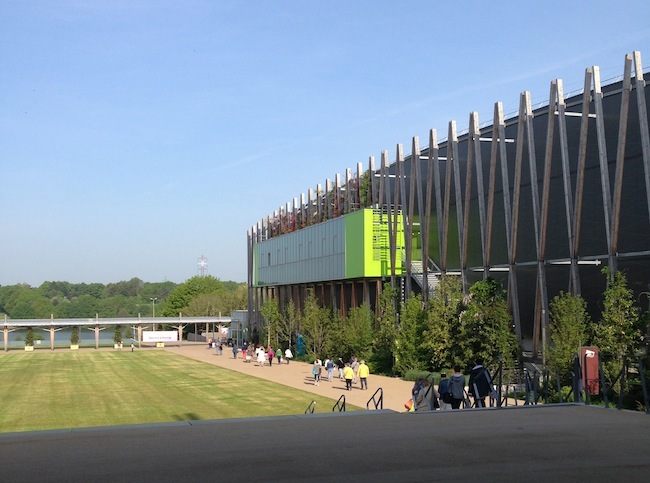 The first day of the show was incredibly busy and it was glorious weather in Nantes. 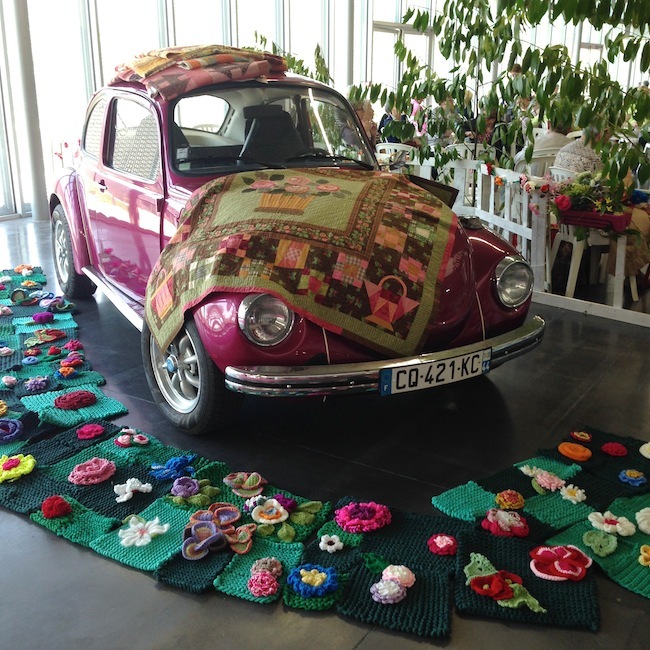 The theme for this year was 'flower power' so we were greeted by giant crochet flowers, floral appliquéd quilts and a garden path of pinwheels and puffballs as we entered the hall. 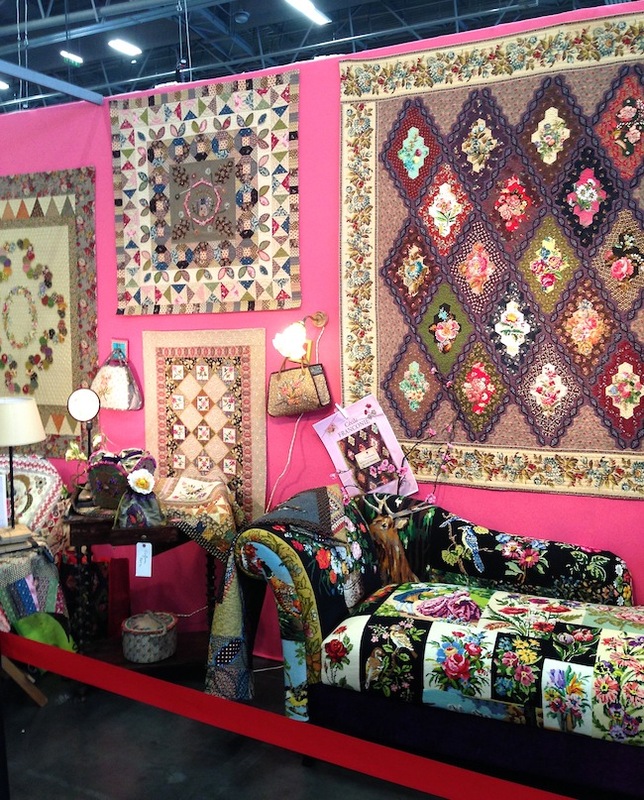 I had the opportunity to have a good puruse around the show in the afternoon, after my morning class with Willyne (more on that in my next post - you can also read a short piece I posted on the Love Patchwork & Quilting blog, since I know those girls are crazy for La Passacaglia!) 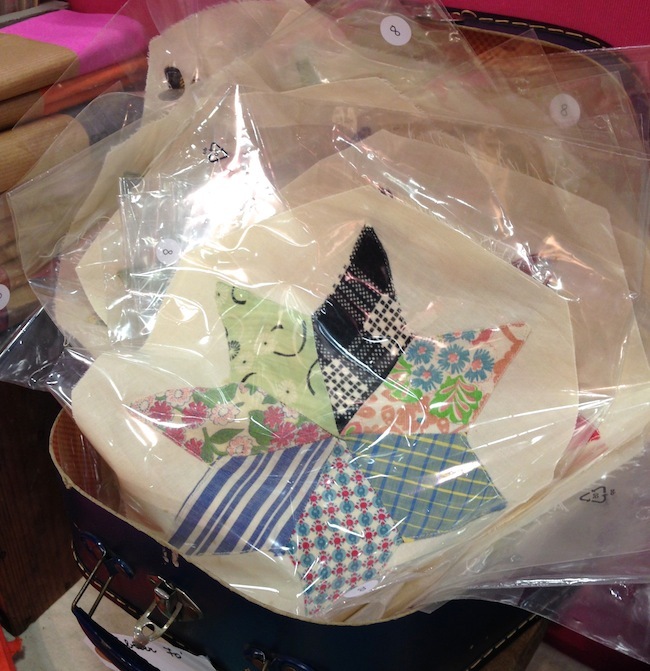 There were lots of shops with beautiful quilt kits and fabrics on display. So I window-shopped around some fabulous stalls. This vintage display caught my eye, of course. 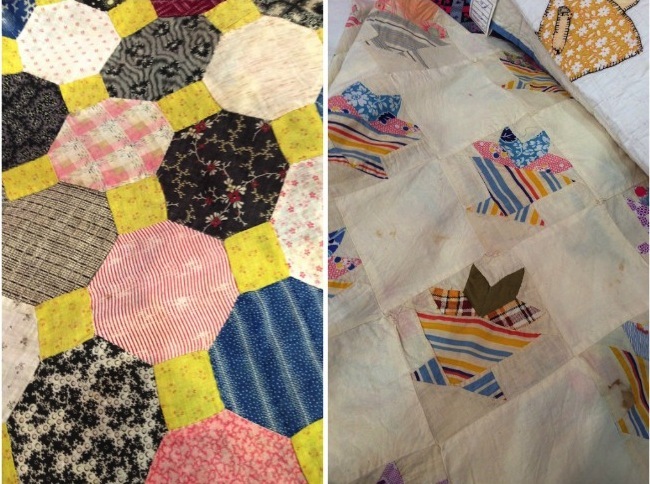 Stumbling on these vintage hand-pieced star blocks reminded me I must crack on with my diamond EPP quilt! 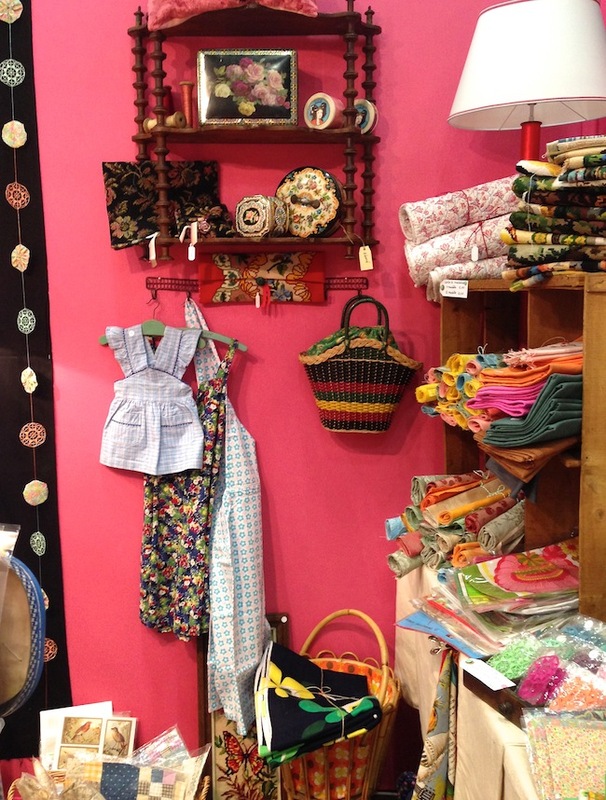 This was the booth for the work of Cecile Franconie, she was set in amongst the shops as she was selling and exhibiting. I've not come across her work before but I understand now, she's a hugely popular french artist who creates very unique quilts embellished with intricate embroidery work. She has a new book just released by Quiltmania too; Fantaisies Faciles Florales. Lovely to see her work up close, very inspiring. 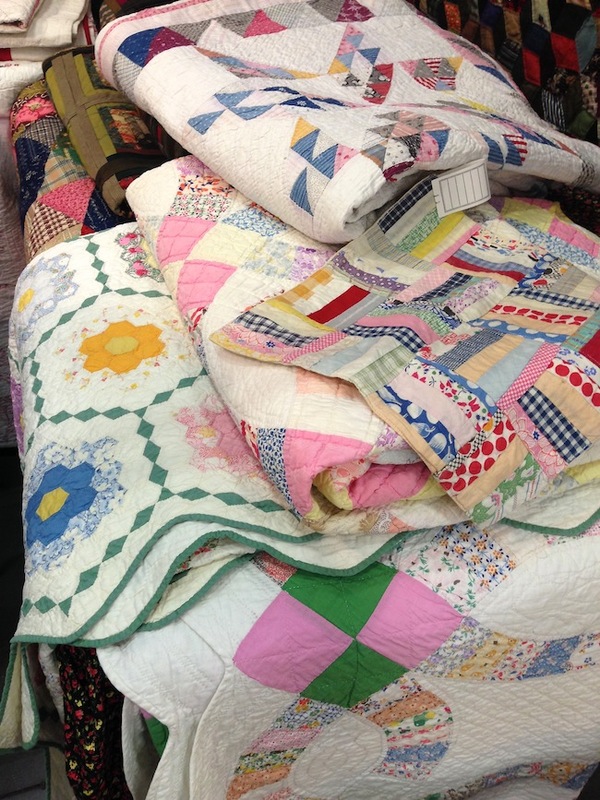 Labors Of Love was a fabulous booth with gorgeous vintage quilts for sale. I could have quite happily have taken all of them home with me, but alas my budget didn't allow. Oh what eye candy they were piled up high though! All my favourite bright colours. Loved this one on the left here, it would work brilliantly with EPP, octagons and squares. Always love a basket quilt too. Ok this was my absolute favourite. It was draped on the side of the booth so I couldn't see it in all it's glory but what a showstopper! The colour's are phenomenal and I was immediately drawn to it. I'm so inspired to drop everything I'm doing and make a giant Lone Star type quilt with these solids. I think some 2" 8-point diamonds and bright Kona solids would be perfect, no? 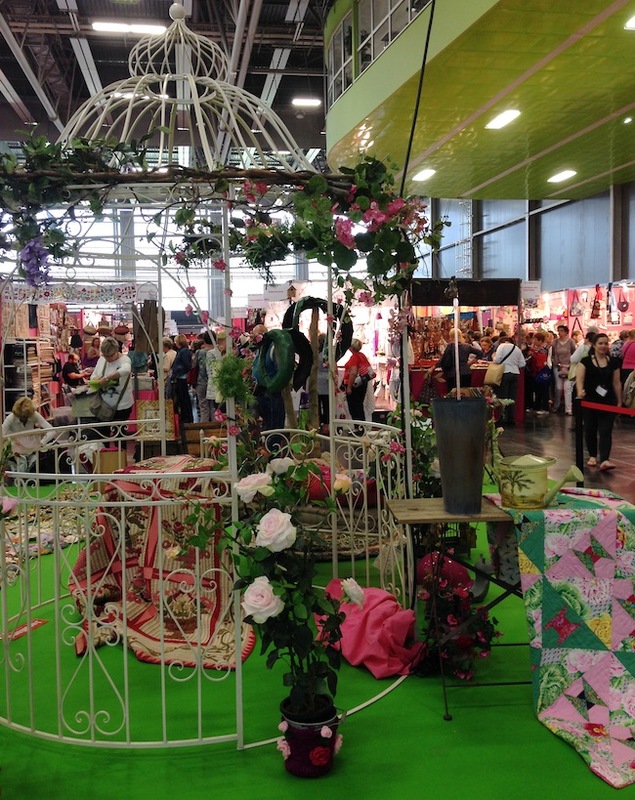 I have tons of photo's to share of the exhibitors on show and my classes with Irene and Willyne, and my sight-seeing around Nantes, so I plan to share those in a series of posts next week. Stay tuned! Wow...........looks wonderful and lots of fun. Love that chaise!! Looks like a great venue and a wonderful experience! I can't wait to see more. When I went to the show about four years ago I found it very expensive an didn't buy much. This looks so wonderful. 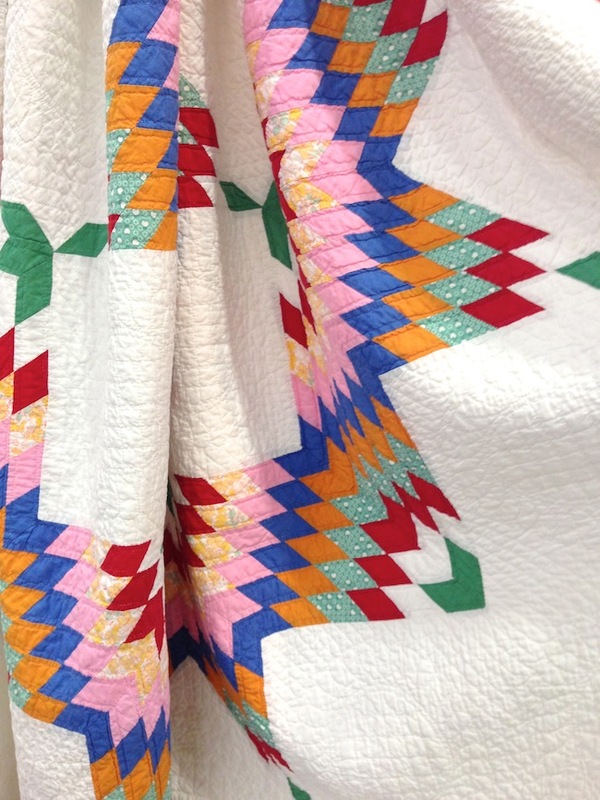 I can easily imagine a gorgeous lone star joining your sewing list. Many years ago I lived in Nantes for 6 months so I am really looking forward to seeing your sightseeing photos. Wow--looks like an amazing show! I would have gone into debt with my credit card though. I'm looking forward to the rest of the report! Great overview on this show. Maybe one day! !